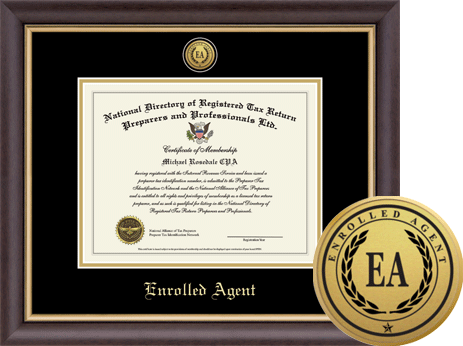 Now you can proudly display your personalized, heavy paper stock, gold leaf, raised seal PTIN registration certificate – great for framing and display in your office and your client waiting room. Let your clients know that you are a “licensed tax preparer”. You will also receive a free digital certificate for use in emails and on your website when you order your paper certificate. Order now – only $39.50 (plus $9.95 shipping and handling). Frame not included. You must have a PTIN to obtain this custom certificate. Certificates should not be displayed if your PTIN registration lapses and not renewed. Custom frames are also available for purchase as shown with a gold engraved medallion of the Certified Public Accountant, Enrolled Agent or Registered PTIN Tax Professional seal set into a 23K bezel, recessed into gold embossed black and gold museum matting and framed in the dark espresso moulding with a gold lip. Link to the custom frames page will be provided to you after purchase of your PTIN certificate. 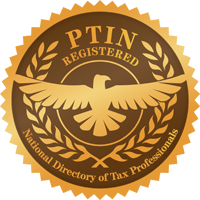 The Preparer Tax Identification Network (PTIN.ORG) and PTINdirectory.com have no affiliation with the Internal Revenue Service or any government agency. They are independently owned by the National Directory of Registered Tax Return Preparers & Professionals, Ltd.